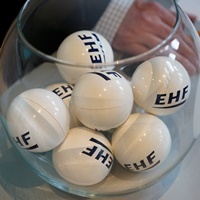 24 June will see two draws taking place in the EHF Office in Vienna. First up at approximately 14:00 hrs is the draw for the first qualification phase of the Women's World Championship 2017, followed straight after by the draw for the first qualification phase of the Men's EHF EURO 2020. They are drawn into three groups of four teams each (Groups 1 to 3) and one group of three teams each (Group 4). The first two teams from Groups 1 to 3 and the top ranked team from Group 4 qualify for the play-offs. Qualification matches are being played in a home and away system, however the member federations of the teams in any group may decide to play their matches in a tournament in one venue. The playing dates for this qualification phase are 5 to 9 October 2016, 23 to 27 November 2016 and 30 November to 4 December 2016. Download the full draw procedure. 24 June is also the beginning of the road to the EHF EURO 2020, the first European Championship that will be played with 24 teams and in three different countries (Sweden, Austria, Norway). This first phase will be played in three groups of three teams each. The winners of each group will qualify for the second phase, the main EHF EURO 2020 Qualification. The playing periods are 2 to 6 November 2016, 4 to 8 January 2017 and 11 to 15 January 2017. The second possibility to qualify for the second phase of the EHF EURO 2020 Qualification is the European IHF Trophy. Registered for this tournament are Albania (to be confirmed), Andorra, Armenia, Azerbaijan, Bulgaria, Great Britain, Ireland, Moldova and Malta.